Author Jae Mazer has a penchant for all things horror, supernatural, science fiction, and beyond. She likes to spin a good yarn, draw readers deep into tense tales, and support fellow fiction writers! I had the pleasure of presenting with her on a panel on horror writing at Comicpalooza Houston 2018, and I’ve become a big fan of her writing. I am excited to get my hands on her new collection “Beautiful Beasts: A Collection of Visceral Horror,” which comes out this month. Jae and I both urge you to read Shirley Jackson. Say tonight. Swan Song by Robert McCammon: I read this book at a young age–I believe I was ten or eleven. It was sitting on the shelf in my dad’s bedroom. The cover intrigued me. Plus, we lived in a town whose mascot was the trumpeter swan, so the title was cool, too. This book almost single-handedly launched me into my love of horror. I have read it twice more in my adult years, and it remains firmly placed as my favourite book of all time. Hands down. Swan Song starts with the nuclear war the destroys the world. In the same vein as Stephen King’s The Stand, Swan Song follows several groups of survivors as they navigate through the confusion and destruction of a nuclear holocaust. What do I love about this book? Though there is a large cast of characters, the powerful protagonists are two women: a homeless woman named Sister Creep, and a young girl named Sue Wanda—Swan. Second, is the gorgeous and visceral horror we see through scenes and setting, action, heart wrenching character development, and the supernatural twist that drives the plot forward. Dark Tales by Shirley Jackson. Dark Tales is a collection of horror I will never forget. I won’t forget the stories, the characters, or the emotions I experienced while reading every one. It is true horror, without the blood, gore, and violence we’ve all come to expect from the genre. Jackson goes for unsettling terror, the discomfort that burrows deep in our thoughts and lingers well after the story is over: The image of an elderly woman as the villain who spreads hate through neatly written letters, Hell as a never-ending loop of a day that’s just not quite right, and the wife who lives knowing that her husband is a serial killer who killed his former wives. Imagery, voice, dialogue, and quiet terror are Jackson’s specialties, and ones that have resonated with me for many years. Something Wicked this Way Comes by Ray Bradbury: My dad was a big fan of the old sci-fi greats: Bradbury, Asimov, and the like. Needless to say, I’m a fan of them, too. Though Dandelion Wine and Fahrenheit 451 were excellent novels, Something Wicked This Way Comes holds a special place in my heart. I can still picture the image of the old carnival witch floating above the houses in her hot air balloon, marking them in silver with the tip of her finger—true nightmare fodder for children sleeping alone in their beds! Like Jackson, Bradbury gives the reader a sense of dread and horror with no violence at all. His voice is artistic and gorgeous, almost poetic. The father and son form a special relationship through the course of the plot. The father himself is a complex and heartwarming character who likens their current plight to the adventures he had as a child. The ringmaster of the traveling circus is a dark character that propels the truly macabre plot along at a terrifying pace. The creation of characters in my own stories has been heavily influenced by Bradbury. I admire his strength for using the characters themselves to conjure the emotions that make his stories so powerful. 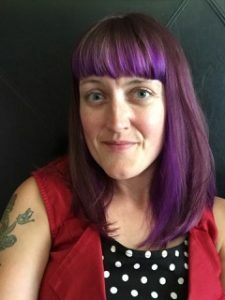 Jae Mazer has six full-length novels published by Netherworld Books in the UK, and one novel published under her own imprint, Feathered Tentacle Press. Jae penned the story Flight of the Crow, which was first published in an anthology by Inklings Publishing, Eclectically Heroic. Two more of Jae’s short stories, The Waif and the Witch and Need, were published in an anthology by Mad Girl’s Publishing, Hair Raising Tales of Villainous Confessions edited by Melissa Algood and Chantell Renee. Jae has won several awards, including first place in the horror category in the ATAB book awards for her novel, Chrysalis and Clan. Her story, The Wish, won second place in the 2017 Channillo short story contest, and was later published in Sicklit Magazine. Look for Jae’s upcoming anthology of horror short stories and flash fiction, Beautiful Beasts: A Collection of Visceral Horror, which will be released on September 13th, 2018. Check her website and Amazon author page for more info on her work: http://www.jaemazer.com. Posted in books, Cross-promotion, TX authors, Writing and tagged author interview, books, fiction, horror, reading.